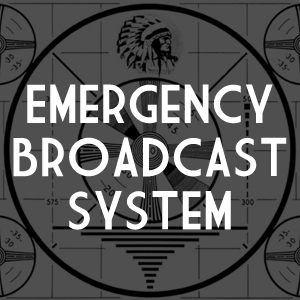 Ever since I was a kid, I wanted to be the announcer for the Emergency Broadcast System. I was fascinated with the periodic tests of the EBS that aired on local television stations. The dire sound of the two-tone Attention Signal — purposely designed to feel uncomfortable to the human ear — the button-down seriousness of the announcer assuring us that this was “only a test” (even as an eight-year-old I could hear the implied “. . . this time!”) — every time I heard these, I stopped whatever I was doing and focused on the TV. Even when I was too young to understand the implications of “a national emergency,” I sensed grave danger in the message. Once I had learned about ICBMs and instant vaporization, mushroom clouds and fallout, the images I could then attach to the “test” made it all the more threatening, like the click of the hammer on an empty chamber in a game of Russian Roulette. Two or three times while changing channels, I happened to turn to a station in the middle of broadcasting the test, so I missed the opening “only a test” voiceover and sat through twenty-five horrifyingly anxious seconds of the Attention Signal, wondering if this time it was the real thing and we were all going to die in a burst of nuclear fire. It was like reading a Stephen King novel while riding a roller coaster, all in less than half a minute. And then the announcer’s voice came on, and he let us all know that this had been a test of the Emergency Broadcast System, and we could get on with our lives. For now. Yes, that Attention Signal gave me a frisson of terror every time I heard it, but the announcer was always there to assure us that it was only a test, that we would get through this. In fact, even if worse turned to worst, then, while he couldn’t do anything to prevent the cataclysm, at least he would be there to tell us where to go for news and official information. But it never came to that, and really, what the announcer did every time was tell me that there was nothing to be scared of. For almost as long as I can remember, I have wanted to be that person, in a way that seems almost irrationally disconnected from anything I actually did that was career-oriented. Pre-med in college; teaching and marketing in Japan; practicing as a lawyer — none of that had anything to do with broadcasting or voiceover work. But this week, a new class of students has entered school, and they’ve come to our career services office in varying degrees of good-hearted panic. They’ve shared with me their hopes of finding the right job and career and their fears that they won’t, that they don’t have the right resume or connections or can’t network or don’t even know in which direction they should be moving. And as I sat with them and spoke to them and assured them that they will get through this just fine, that the world is not coming to an end, and, here, let me pass along this news and official information — I realized that maybe, in a way, I have become the Emergency Broadcast System announcer I always wanted to be. Relax, everyone. This is just life. This is only a test. Great article- it reminds me that what I enjoy most about both the practice of law and law school career counseling is providing “important official information” as well as much-needed reassurance to people facing challenging and stressful situations. Thank you, Patricia, and I love it that you pointed out that providing information and providing reassurance are key facets to both practicing law and career counseling. I think that this is why a good practitioner maintains a humane outlook, despite the cold calculations of justice and commerce, and why a good counselor makes sure her clients’ touchy-feely ambitions are grounded in reality. I think you are the first person I have ever heard of that wanted to be the EBS announcer as a kid. 🙂 But congratulations on achieving that dream (maybe metaphorically) in your own field. Strive to be that calm, authoritative, voice in the chaos. I feel like watching Gilligan’s Island and I Dream of Jeannie reruns now. A Philadelphia radio station IWFIL) in the early 1970s gave us an example of what we may hear in the event of an actual attack. This has been a nice step back into time…Thank you! That . . . was . . . GREAT! Thank you so much for posting that video! It was like being allowed to sit in on the boogeyman’s autopsy! Thank you! News anchoring sounds pretty close to EBS announcing to me — authoritative, direct, informational. Good luck in your career. Great analogy to your present position and the EBS. Thank you! Except I don’t have an Attention Signal in my present position. And I probably could use one. Except it isn’t, is it? And people don’t always get through it. A. Depends what you mean by “test”. When life is not “just a test” (i.e., when it really is a catastrophe), it is usually still a “test”. B. As some wiseguy once pointed out, *nobody* gets out of life alive. But, to be less flippant: In general, the ratio of perceived disasters to actual disasters is so high that I haven’t yet encountered a student in the midst of an actual disaster. And, in truth, many students who are in the midst of an actual disaster don’t actually realize it, and thus don’t come to see me. Oh, that is funny. I’m sure you’re right. It’s interesting how the element of “fear” has remained embedded in you over the years. Fear, is a very strong emotion, and regrettably, is used as a weapon by our politicians. Ahhhh, I do love the actions of politicians and the fear they pedal. I’ve done many cartoons on them, often in an endeavor to “defuse” their spin. A window on Australian politics I’ve never had the opportunity to look through before. Fascinating. As for fear, it is much maligned, because people sometimes fall victim to it inappropriately; but it has always had an innately useful purpose and value. Not unlike lust, hunger, competitiveness, sugar, etc. EBS, nice. I wanted to be a cop and I ended up being a criminal in my late teens. For me it changed probably twice or three times a year. Every time my five year old daughter comes home she wants to be something else too. Then real life pops up and we set our goals and try to meet them. Sometimes we don’t end being exactly what we set out to be but it is still along the same lines. For example, instead of a marketing agent, a consultant on advertising. Nice Post and congrats on being Pressed. This is excellent and I can tell you I’m right there with those students. Thanks for sharing! Your description of the emergency broadcast system test brought back a flood of memories – great read. Thanks. I remember when radios had the Civil Defense symbol on the dial indicating where to tune for that further information and those instructions. Thanks for the stroll down memory lane. Thanks to the efforts of Tom Truscott, Jim Ellis, and, of course, WordPress, for paving the way for your voice to be heard. A different time – back then. I remember all too well the sense of initial panic that slowly turned to intrigue over the years. I remember “Bert the Turtle’s” Civil Defense messages, that taught us well how to duck under our desk and “survive” this sort of national emergency. Interesting how these images became a part of who we are; You wanting to be the broadcaster, and I wanting to be some kind of hero. More important is how we subconsciously followed that path and although things might not have turned out exactly as planned, the influence is clearly there. I absolutely agree – well done to you for achieving greatness! Now I know there really is the right person for every job. Congrats on being freshly pressed. Having found myself as a teacher, I’ve twisted and turned myself around in many careers. I loved your conclusion. It’s great for college students to read. I’ll be passing this along. Maybe you can be the voice of the movie phone guy! Before a new retail item is approved for mass production, before a web site is live and viewable by the public, before a recipe is added to the menu, one person or a team of persons would have to ensure the materials used are correct, the design and user experience is properly coded, and the ingredients are right. And if anything is amiss, it’s still okay, because “it’s only a test.” A demo. None of the mistakes count yet. I’m too often up late at night (like now) watching TV and when those tests come on, they still scare the bejeezus out of me. As does figuring out what to do when “I grow up” (I’m 39). But your “announcements” here help keep me calm. Lovely post! I knew what I wanted to do with my life at the age of 11 after my first English class (I’m French): I wanted to speak English! I moved to the UK over 15 years ago, and now my blog is helping me connect with people in the USA, Canada, Australia and the rest of the world, in English. What a joy! sweet!! !… lovely! !…loved how you ended it, i am in full agreement ..and it did leave great impact!.. It IS an unusual desire for a job. Brings back memories of the Four Minute Warning when I was in the UK in the 1970s. I thought I was the only person in the world that wanted to be an emergency broadcast announcer..Now I know there are at least two. That’s it, I’m going to start looking for job postings – wish me luck! I live on an island so to get off I have to take a ferry (or fly). The ferry has an automated safety announcement that I always used to listen to with anticipation. They changed the recording recently, and I also got to meet the person who’s voice it was that they changed from – the original safety voice. He said it was his favorite job (even though it only took one afternoon to record) and he liked the idea of imparting his important information to all the travelers, just in case they might need it. Delightful post about a career I’m sure not many people have given much thought to. I wanted to be a ballerina and a park ranger and I don’t really remember in what order, or if I wanted those careers at the same time. A great metaphor for these times. . .this is only a test. BTW, I never did become a park ranger, but I managed to dance for quite awhile. Great story. Love your last line, “This is only a test.” Perfect ending! Great post! Life does, indeed, go on. And we got through the dangerous phases of that Cold War. How, I am not sure. But sanity did prevail. I was actually born at a moment when it threatened to go hot – bang in the middle of the Cuba crisis. I believe the British version of the EAM (‘Protect and Survive’) was voiced by Patrick Allen, a character actor who also did voice-overs for the first series of Blackadder. Thanks for sharing.. in my day the test came on between scooby doo and What’s Happening, everyday.. like clock work, you could count on it like you could count on the rough Louisiana roads I grew up on! Cool as hell. You sure did become a real-life EBS. My friend Dave was the voice of the Prince William movie theatre back in the 80s. As this was pre-internet (wierd), whenever anyone wanted to see what movies were playing, they had to call the theatre and listen to the recording. Our group of friends still bring it up years later, and ask him to do an impersonation. Not sure how much is secretly making fun of him, but I have to hand it to him, he sounds pro. Wow, I got chills near the end. Good-Post Inducing chills… NICE ONE! Reblogged this on Official Court Record.